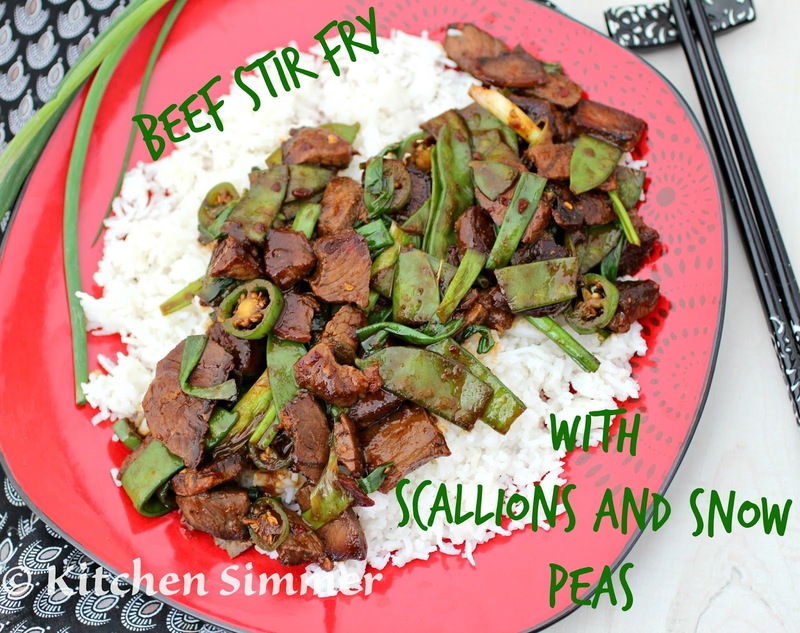 This Stir Fry Beef with Scallions and Snow Peas is a quick and easy Chinese dish that will have you putting away those take out menus for good. Sometimes making a stir fry can be very time consuming when you have to chop, slice and dice all those vegetables. In this very simple stir fry, I used frozen snow peas, two jalapenos for heat and a lot of scallions. I simply adore scallions. They give such a wonderful and fresh onion flavor and really make any dish pop. We usually relegate scallions as a finishing ingredient or a fresh garnish for Asian meals. I think scallions are so delicious they should be front and center in the a dish like this stir fry. The sauce is also very simple with just soy sauce and Hoison sauce. Now I do use Chinese cooking wine called Shaohsing wine, but you can always substitute cooking sherry or dry sherry if you cannot find it in your grocery store. I love everything a bit spicy so I added jalapenos and red chili flakes, but you are the boss in your kitchen so add what you like. This stir fry is simple in ingredients, but full of bold flavor. So buy a bunch of scallions and make it the star of your next dish. Cut beef into small and thin bite size pieces. Season cut beef lightly with salt and black pepper. Heat pan on high heat and add 2 Tbs canola oil. Then add beef and sear well. 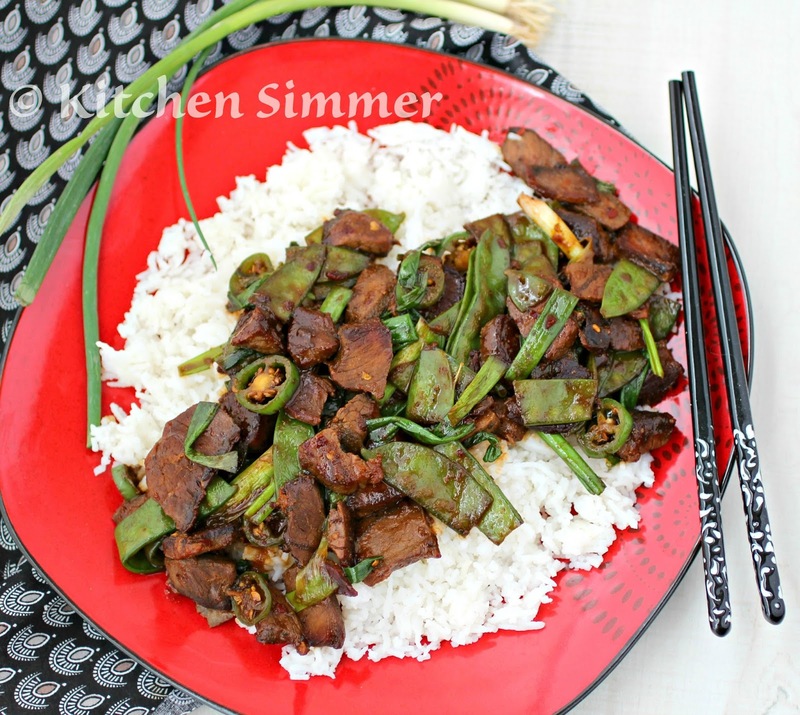 When beef if cooked, lower heat to medium and add garlic and ginger, jalapeno peppers, snow peas, and 1/2 the scallions. Saute well. Then add the sauce ingredients and chili flakes, toss well and cook for several minutes. Next Add the 2nd half of the scallions to the pan and toss well. Cook for a minute and taste for salt and seasoning. Adjust as needed. Serve hot with rice. Enjoy. What a tasty looking recipe. Perfect as we get closer to chinese new year. I'll be pinning this for sure! I must admit I had to google what you meant by snow peas :) we call them mangetout in the UK! Love that this recipe only has a handful of ingredients but packs in a lot of flavor! Sounds like a winner for a week night dinner to me! My mother in law is acted to stir fry recipes, especially ones with beef. Love that it expands past the typical broccoli and beef. This sounds great! Can't wait to share with her! I love everything a bit spicy too so I too would add the jalapenos and red chili flakes - but otherwise, this recipe is delightful Ramona! Oh wow, this looks amazing, I love the jalapenos in this recipe!!! What a great, fresh meal that packs some heat. Love this dish Ramona!!! I'm a big fan of green onions so I'm thrilled that you use a good amount of them in this. It looks delicious. 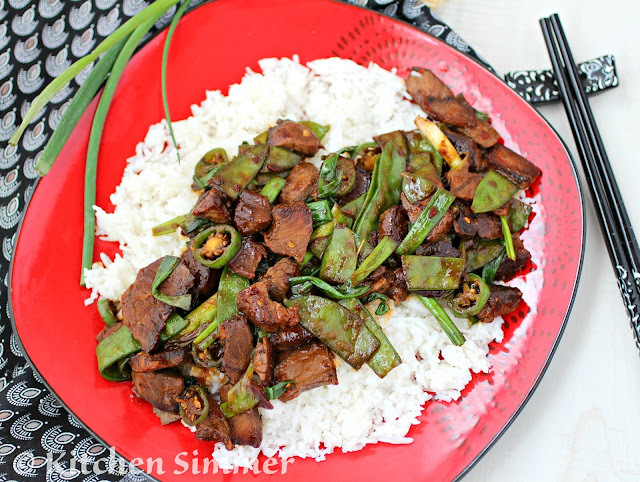 I saw green onions and instantly made this dish! subbed out a few ingredients because it was all i had on hand but still turned out tasty; mushrooms for beef, and homemade hoisin and extra salt becuase I don't use soy sauce. In hindesight, I should have used one jalapeno instead of two (cooking for one, so I halved the recipe) because it was super spicy!